The big event this rather damp September was the 6th Annual Sacrum Profanum Festival. The profile of this fairly new but groundbreaking festival is markedly different from most other such events that exist in Krakow. Sacrum Profanum pushes the boundaries and presents concerts of contemporary and modern classical music as well as groundbreaking pop and even electronic music from the 20th and 21st centuries. While this year’s festival certainly had numerous concerts of note (Stockhausen in the Schindler Factory was fairly life-changing), I will cut to the chase and get right to the legendary men-machines themselves – Kraftwerk! And the music? Let me begin by saying that the progressive historical irony of a German band singing in Polish in a Soviet-built iron works was enough alone to send shivers down my spine. The fact that the band was Kraftwerk turned those shivers into electronic shockwaves that rumbled through my lower intestines from the plethora of precision crafted synthesized beats and visual treats. They performed a blinding and stunning 2 hour set which included most of their global hits spanning their almost 40 year career. The quartet was as stoic as ever, and each member dutifully manned their computer battle station – respectively pointing, clicking, twisting and playing their ageing hearts out. As boring as it may seem to watch ageing German men ostensibly play solitaire for two hours, there was something enticing and intriguing about their stage candour – almost a game to try and figure out who was making what bleeps and which blurps when. The visual graphics were of course much more of the spectacle then the band themselves and they did not disappoint. The sound in the factory was truly amazing and the entire building rattled whenever they engaged the turbo uber bass. 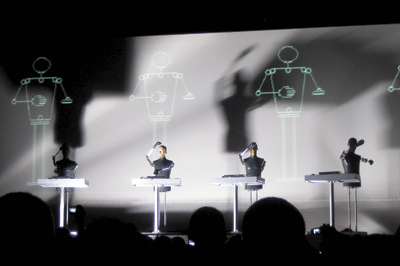 They treated the throbbing crowd (and seated audience) to two encores – the first of which was performed by their robot look-alike buddies (although the resemblance is a bit strained since two of the members are no longer with the group and the other two have aged severely since the robots were completed in the early 70s), and the second encore was performed by them but in their neon striped spandex matrix suits. I can honestly say the experience was once in a lifetime and there is no question that Kraftwerk have left their mark on Krakow for a long time to come.